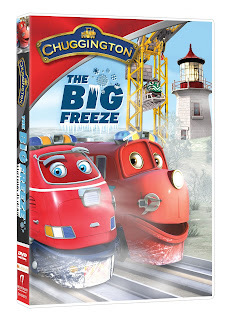 September 14, 2015 – Cool high-speed adventure is on the way to preschoolers nationwide with the newest “Chuggington™” DVD, “Chuggington: The Big Freeze”! The latest release in the popular DVD collection from Anchor Bay Entertainment is jam-packed with six fun-filled adventures – including a never before seen holiday special episode from the top-rated Disney Junior series. “The Big Freeze” pulls into retail on October 13, 2015, just in time to help families from coast-to-coast celebrate the season – Chuggington style! The chuggers perform one heroic rescue after another in this cool new seasonal collection of “Chuggington” adventures! When icy temperatures cause the town to run out of fuel and all diesel engines are grounded, it’s wheels-to-the-rails as Chief Jackman and his team of brave Chug Patrollers work together to find a way to the frozen docks to retrieve fuel and get the town of Chuggington moving once again. Fans can join Fletch as he tries to repair the lighthouse, chug along with Calley as she tests to become a first responder, watch as Brewster gets closer to being a Chuggineer, and more! “The Big Freeze” will help teach little chuggers nationwide important lessons about safety, responsibility and teamwork as they ride alongside their favorite friends, Wilson, Koko, Brewster, and Asher! · The Big Freeze – Never-before-seen holiday special! Young fans can experience even more “Chuggington” fun at Amtrak Train Days events, taking place across the country. For information visit https://amtraktraindays.com/events/.